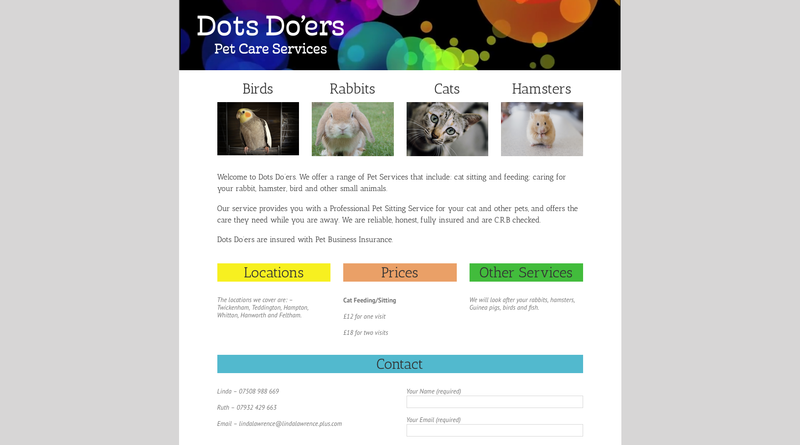 Local pet service company, Dots Doers were looking for a way to make their mark on the web. So we created a brand new website for this friendly pet services business covering the Twickenham, Teddington, Hampton, Whitton, Hanworth and Feltham. During the planning stages, we decided that a simple one-page website would work best for Dots Doers, communicating all the necessary information to the user (such as location, cost and services) all in one place. The main feature of this colourful is website is the animated dotty banner which adds to the fun and approachable nature of the brand, coupled with the amiable rounded font used for the company name.